I recently had to get myself registered under Goods and Services Tax (GST) so that I can file for GST on my earnings. Once you have a GST number, you need to file your tax return every month (in India). So every month, my Charted Accountant would reach out to me asking for sales invoices so that he can file for the GST. In my case, there only a handful of invoices to be created, as I have only a few sources of income. However, since this is additional work, I wanted to get this done as quickly as possible. So to minimize my effort, I created an Invoice Generator template in Excel that allows me to have all the data in one place, and then it automatically creates PDF invoices for all the data points. As you can see below, all I need to do is double-click on the client’s name (in column B), and it would instantly create and save the invoice in the PDF format in the specified folder. 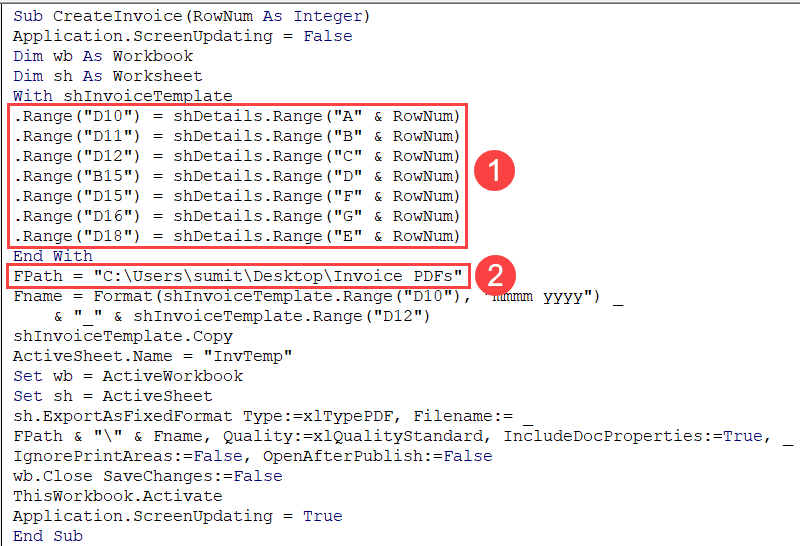 You can also modify the invoice template to suit your company’s format (which would require you to change the VBA code a little – explained below). How does this Invoice Generator Template Works? Where is the code in the workbook? Details – This is where you need to specify the details of the sale/transaction. To keep everything together, I have created one row for each record. All the details of a transaction are recorded in the row. Invoice Template – This is a placeholder template of the invoice where some fields are left empty. I need to generate a separate invoice for all the sale records and the details for each invoice is picked up from the Details worksheet. I also have a folder on my desktop with the name ‘Invoice PDFs’. This is the folder where the newly created PDF invoices are saved. You need to double-click on the client’s name (highlighted in orange in the Details sheet). Details for the client and the sale transaction are picked up and the invoice template sheet is populated with these details. A new workbook is created that has the details of the selected client (on which you double-clicked). This workbook is saved as a PDF in the Invoice PDF folder. The new workbook is closed without saving. In case there are any changes in the invoice details, you can double-click on the client name again, and a new invoice will be created (and this will overwrite the old one). Note that the names of the invoices are based on the month and the invoice number. For example, an invoice with the date 15-04-2019 and the invoice number as 1 would be saved with the name April 2019_1.pdf. This helps in keeping track of the invoices in case you have too many. I created this invoice template with a format that I needed for my GST filings. 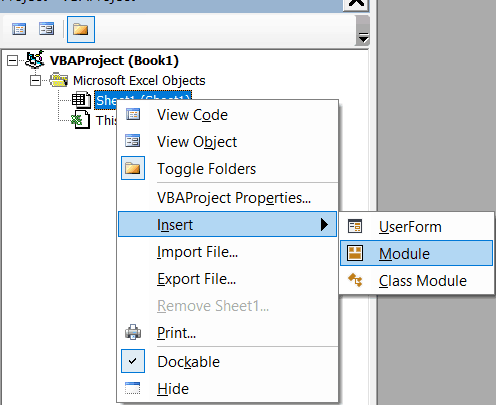 If you need a different format, you’ll have to edit the template and then adjust the backend VBA code. The above code is what copies the details of a transaction, fills the invoice placeholder template with those details, creates a new workbook, and save the new workbook as a PDF in the specified folder. 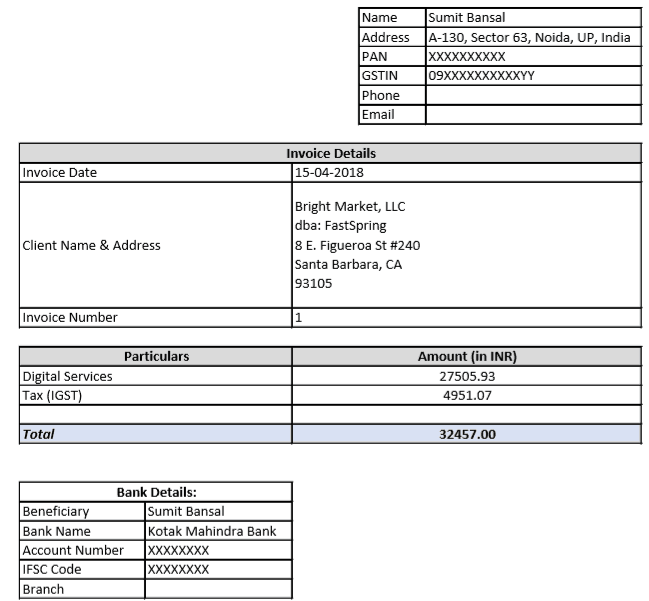 The first highlighted section is what takes the details from the Details sheet and populates the invoice template. If you decide to modify the invoice template, you need to make sure you are picking the right details by modifying this part of the code. This line specifies the folder location. In my case, it was a folder on my Desktop. You can specify the address of the folder where you want the invoices to be saved. Note that I have renamed the worksheet code name to ‘shDetails’. I have done this so that I can use the name – shDetails – in my code and it would continue to work even if you change the name of the sheets in the worksheet. If you want to learn more about the sheet name and the code name, have a look at this (check out the section on using the Worksheet code name). 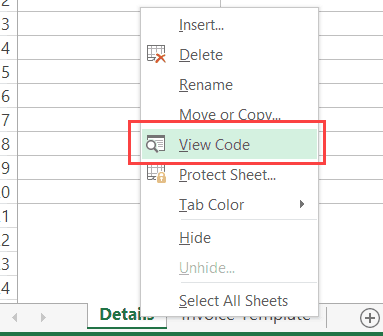 The code is placed in the back-end of the Excel workbook in a module. Click the Visual Basic option. This will open the VB Editor window. In the Visual Basic editor, double-click on the Module to open its code window. You’ll find the code mentioned above. In case you’re creating a template yourself, you may not find the Module in a new workbook. You need to right-click on any of the workbook objects, go to Insert, and then click on Module. This will insert a new module. The above code does all the heavy lifting, but you need to connect it to the double-click event. This means that the above VBA macro code needs to run whenever someone double-clicks on the filled cells in the client name column. Click on the ‘View Code’ option. Copy and paste the above code into the code window that appears. Checks if the cell that has been double-clicked has the client details or not. It uses the IF statement to check and run the code only if the cell is not empty and in Column B. If both the specified criteria are met, it disables double-click functionality (which is to get into the edit mode) and calls the ‘CreateInvoice’ subroutine, which is stored in the Module. It also passes the row number value to the subroutine. For example, if I double-click on the client name in the third row, it will pass 3 as the value to the CreateInvoice subroutine. Once the ‘CreateInvoice’ subroutine is executed – which creates the PDF of the invoice – it ends. Click here to download the Invoice Generator Template file. The above code saves the invoice as an Excel workbook with the same naming convention. The worksheet in the workbook that contains the filled invoice in each saved workbook is also named the same. How to Convert Excel to PDF Using VBA. Extract Data From PDF to Excel with this Converter. Could you please advise me regarding below topic. I would like to have several products in one invoice. which part of the code should I change? Unable to download the file. Seems corrupted. Please help us for downloading the file.